Martin Sinclair, brother of Swansea player Scott Sinclair, has been named in the football squad for the London 2012 Paralympics. Sinclair is among 12 players selected for the seven-a-side team for players with cerebral palsy. A further 10 players have been selected as part of the five-a-side team for players with a visual impairment. Among them are Dave Clarke, who has won the Golden Boot at three World Cups and has scored over 100 goals for England. Clarke is one of three members of the team who represented GB at the 2008 Paralympics in Beijing, along with Keryn Seal and Will Norman. Sighted keeper Dan James is also ready to appear in his second Games and Darren Harris, who represented GB in the judo competition four years ago, switches sports for London. "The confirmation of my place in the squad is the realisation of a lifetime dream and a unique chance to compete at the pinnacle of my sport and on home soil in front of our own fans," said Clarke. "From the moment I heard the remarkable announcement that London had been awarded the 2012 Paralympics, the journey to selection and competing at the Games has been my life. Selection is merely the start of the hard slog toward a medal, however, and the real work begins now to achieve what we all unanimously crave." On the seven-a-side squad, Michael Barker, who used to play at Everton FC Academy alongside Wayne Rooney before sustaining a head injury, has been selected for his second Games while Matt Dimbylow and Jonathan Paterson will also be hoping to better the team's performance in Beijing. Four years ago the football teams both missed out on medals with the five-a-side team finishing fifth while the seven-a-side team came seventh. What does blind football look like? 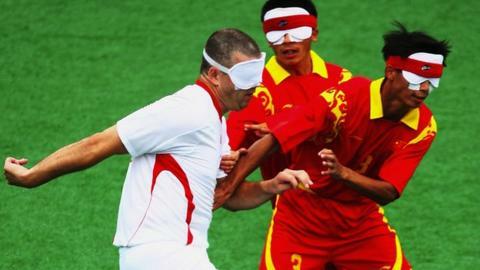 Read more on What does blind football look like?